Choose your three favorite cute monster art from my selection of nine monster prints! These adorable and oh so not scary little monsters are a fun idea for a nursery or playroom! My monster prints also make a great baby shower gift! My monster art prints are hand drawn before being scanned and colored digitally. 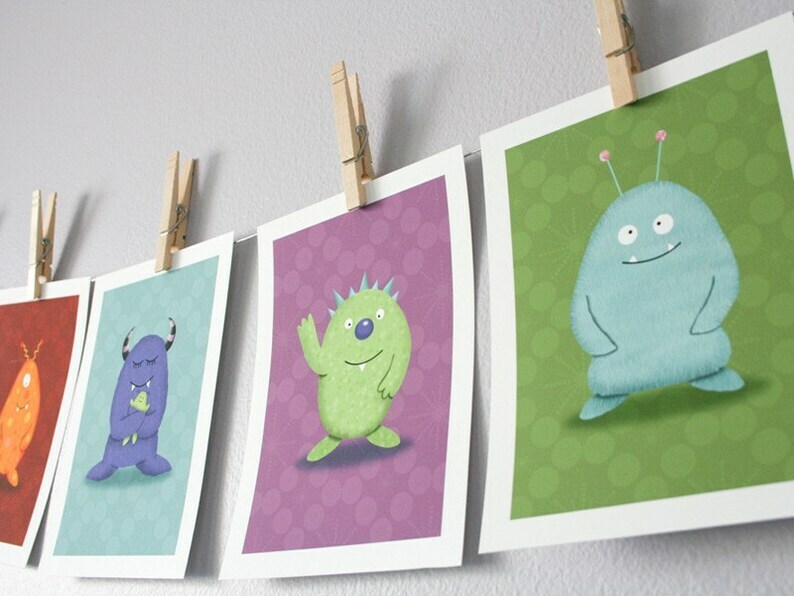 I then print each cute monster with a professional printer using archival inks, and acid free fine art paper. Monster art prints are 5" x 7" with 1/2" white border, perfect for easy framing. These cute little monsters are ready to ship! Artwork will be put in cello sleeves and a hard mailer. Please list which prints you would like (photo #4) in the notes to seller during checkout.